Homesteading can be tough, and we’re here to help others succeed. We maintain a blog here to contribute to the collective homesteading knowledge available. We have taken a step back from our own homesteading, and are not adding to the website much at this time. We are changing the farm store setup in 2019. The farm store is now open by appointment, and we offer delivery to the town of Leesburg with a $40 minimum order. To schedule a farm store visit, or place an order for delivery, just send us an email. Here is a list of our current product offerings. We have some changes there, and are now focusing on eggs, candles, and soap and bath products. The link shows full details and prices. We have a surplus of 64oz hand soap and body wash refills, and are offering a great deal on them! Each bottle is only $25, which is 50% off the MSRP of $50! Like all of our Whispering Willow products, these items are made with top of the line organic ingredients, lovingly blended to personal recipes by a husband and wife team in North Carolina. Does it get more eco-concious than that?! These soaps are scented with only essential oils, no synthetic fragrance. We have lavender, lemongrass, peppermint, and tea tree varieties. 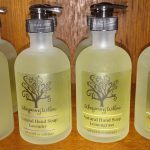 Email us to buy hand soap and/of body wash refills either by coming to the farm store or via delivery to Leesburg. While it may be cold, the days are growing longer, and that means more eggs! Eggs are $5/dozen. We have reorganized our farm store, and have some items for sale! (Contact us for photos or more details). First, we have two vintage fruit crates for sale at $15 each. Next, we have some photo canvas prints of our own amazing farmstead! Both are 18″x24″. One photo of is of our beautiful farm fresh chickens eggs, the other is of our pigs in the woods. $10 each. Third, we have FREE corks with the purchase of any other item! Need corks for your next Pinterest project?! We have so many for you! (Jar not included). Buying Your Farm in Northern Virginia? This past weekend I was showing houses to some Independence Homestead customers who are looking to buy their own bit of farm property! I love opportunities like this to share the wisdom I’ve gained to help others find the perfect place to call home. If you’re looking to buy or sell real estate in Northern Virginia, I’d love to help! The farm store will be open by appointment this month. This month’s sale is 20% off all candles! We offer a variety of aromatherapy candles scented with essential oils, as well as unscented beeswax candles. The farm store is also stocked with our organic soaps and bath products, household goods, fresh eggs, and some rabbit meat and pork. Send us a note to coordinate a visit! Homesteaders of America is holding a conference in Front Royal, VA on October 12 & 13. We have not gone to this conference before, but we’ve heard good things about it. This is a great opportunity to learn about many homesteading skills! Full details are on the HoA website. Want to make a delicious dinner like this, but don’t have time to shop at the farm store? We deliver to customers located in the Town of Leesburg every other Tuesday! We require a $20 minimum order, which can be met with any of our products: eggs, meat, candles, soaps, etc. Email to learn more! Since we’re taking a break from breeding Silver Fox rabbits, we realized our past clients may need a new source for infusing genetics into their rabbitries. To that end, we are putting together a contact list of those who are interested in exchanging rabbits with others for fresh genetics. You must breed purebred, pedigreed Silver Fox rabbits to be applicable. If you’d like to be on this contact list, and receive a copy of the list, email us! We’ll assemble the list and send it out to all participants this month. Update 8/24/18: All Rabbits Have Been Sold! We are taking a break from breeding Silver Fox rabbits for a while. We’ve greatly enjoyed the years we spent raising rabbits, but it’s time for us to focus on other endeavors. We have a few rabbits left for sale, detailed below. Please contact us if you’d like to purchase any of them. We have two breeding rabbits left ;you can see photos of them here. Alfalfa is a buck with a calm demeanor and great build, he weighed 10lbs on 8/12/18. He’s blue, and his parents are Delilah and James. He was born in November of 2014, and is still going strong. He’s available for $40. Croissant is a blue doe that carries the genetics for all 4 colors. She weighed 9lbs on 8/12/18, and she’s probably skinny right now since she is nursing a litter. Her parents are Delilah and Baron. Born in May of 2016, she’s been a solid breeder for us since early 2017. She is nursing a litter of 6 blue kits that would be sold with her, born 7/12 and able to be weaned on 9/06. They were sired by Miles Davis Jr.. Croissant and her kits are $80. One junior blue buck is available. He carries the genetics for all 4 colors. His parents were Dijon and Donut, and he was born on 6/06/18. He is $40. Contact us today to purchase any of these rabbits! The farm store will be open today, Saturday the 4th, from 2-4pm. This month’s sale is 20% off all pork products! You can cook up some delicious and healthy farm raise pork chops like the one pictured at right. Pork offerings include sausage (loose and link), chops, spare ribs, and ham hocks. The farm store is also stock with naturally scented aromatherapy candles, beeswax candles, organic soaps and bath products, and fun household goods! Farm store address and directions are here. We hope to see you thisafternoon! We have a few rabbits for sale, details below. You can see photos and details of the breeding stock (parents) here. Please contact us to buy any of them! 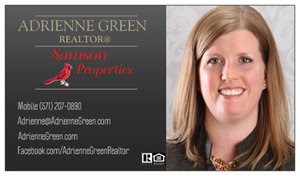 I (Adrienne) am a real estate agent licensed in Virginia, and can help you with any real estate transaction. For those of you looking to move out to the country or sell your existing homestead, my personal experience living in the country will be a huge asset as you consider the unique dynamic of country living. To learn more about my services, please visit my website and Facebook page. You can email me or call me at (571) 207-0890 to discuss your real estate needs today! Our Independence Homestead rabbitry is spreading Silver Fox rabbits all over the eastern half of the country. In 2017 we were amazed that customers came from as far south as Georgia, as far west as Kentucky, and as far north as New York to get our rabbits. This year we’re sending rabbits even further! Last month several rabbits moved up to Maine. Last week a trio moved to Montana. This week more rabbits are moving all the way to South Florida! 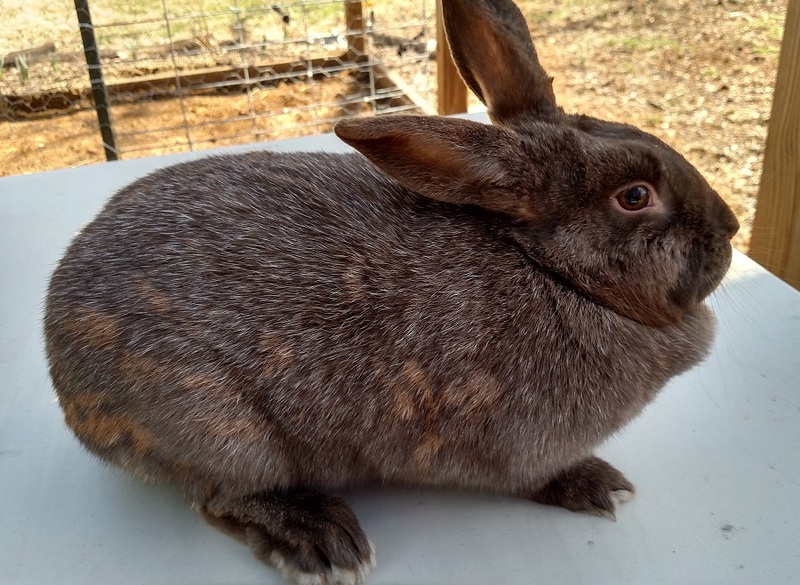 We love our Silver Fox rabbits, and we are honored to help sustain this heritage breed through our rabbitry. If you are looking for some great rabbits, contact us! July Newsletter- Farm Fun: Store, Rabbit Class, Rabbit Sales and Real Estate! In July we will NOT have open farm store hours on the first Saturday. We will be open by appointment, so please contact us to get your farm fresh goodies next month! Here’s a house with 16 acres, mostly pasture, that would be a great fit for many wanting a life in the country. I can take you to tour this house, or we can find others on the market that fit your needs in your price range. Reach out today! Mark your calendars and reserve your spot for the Raising Rabbits class! You’ll want to attend if you are considering raising meat rabbits or would like to gain insight to improve your existing rabbitry. In the class we’ll cover health care, feeding, housing, breeding, and have a dispatching and processing session! We also have a special offer for class attendees: 50% off their purchase of rabbit meat in the farm store immediately following the class! The class is Saturday, June 30th 9-11am. The cost is $20/person or $40/family. Contact us to reserve your spot in the class; please let us know how many will be attending. Rebecca loves her rabbits, as you can see in the photo, but we have a surplus! We have junior and adult rabbits available now. Fill out the breeding stock order form to get your order in! I’ll reply ASAP with what we have available to meet your needs. Are you considering taking the plunge and getting into homesteading, looking to move out onto some acreage, or ready to sell your country estate? Adrienne can help you now! 5 years ago we moved out to the country, and looking back on that time, there are so many things that could have been better about our experience searching for and purchasing our homestead. One of the challenges that made finding the perfect piece of land difficult was that we did not have a real estate agent that knew about country living. Trying to search for a perfect homestead using internet searches and online resources can be really challenging, as so many listings may not have many details listed online about things that are relevant to homesteading. We were shocked when it came time to start touring potential properties because our agent had only allocated around 20-25 minutes per property. For anyone who is interested in moving to the country, you know that the actual house on the property is only a small part of the things you care about, but our agent at the time did not understand this. We were then rushed to get through looking at the physical house and barely had anytime left to explore the land. When we did have time to walk around the properties, our agent could not offer any insight into what potential uses were available on the land and how we might utilize the available resources on each property. Other things we would have liked in a real estate agent as we were looking for our homestead was one that could provide information about potential land use options (tax deferment), agricultural zoning, neighboring property operations, and better understanding of the value of land. Just as finding and buying the perfect homestead can be difficult without the right real estate agent, so too can selling your homestead or country estate. In our neighborhood we have seen properties sit on the market for 1 or 2 years because the home owners opted for a real estate agent unfamiliar with country living and unknowledgeable about how to properly market and price the home. An agent that is unfamiliar with country living may look only at the physical house and offer advice only related to staging the home, when potential buyers may be equally interested in the features of the land. As many of you know, in addition to homesteading, we have been actively involved in real estate investing in Loudoun County over the last 5 years. We have been involved in numerous purchases, sales, and rentals of our personal properties. After all those experiences we decided that just as we have made our knowledge and experience from our homestead available to the larger community through classes and our website, we have decided that now is the time to take our unique combination of experience and skills and help others find or sell their homestead through a full-service real estate business. If buying or selling your homestead or country estate is in your future, please give Adrienne a call or email to see how she can help you get the best possible experience! In June we will NOT have open farm store hours on the first Saturday. We will be open by appointment, so please contact usto get your farm fresh goodies next month! Our friend Kelsey has one, maybe two, goat wethers for sale. They are purebred Alpine goats, born March 18 of this year. They’re $100 each. Contact Kelsey if you’re interested! Like Us? Give a Google Review! We are passionate about providing good service, and helping the community with our products. If our little homestead has been a blessing to you, please consider reviewing us on Google. This little act of yours would be a big help us by allowing us to serve more people! Thank you! We have so many happy hens laying eggs, this month’s special is chicken eggs on sale, $3 per dozen! Come enjoy delicious, farm fresh eggs! The farm store is stocked and ready to supply you with plenty of wonderful treats. We have a wonderful selection of pork, rabbit meat, eggs, natural soaps and bath products, candles, teas, and household goods. 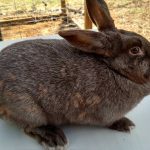 For past, current, and future rabbit breeding stock customers, we have updated our website’s “Our Rabbits” page to highlight our current breeding stock. Check it out to see who we have now! We also have several junior rabbits we’re growing out to be possible breeders. They look very promising! We are looking to diversify our rabbitry’s genetics and are in the market for a buck that is either chocolate, or carries that color. The buck could have our rabbitry in its pedigree, but would need outside genetics as well. Please contact us if you have one available. We’d be interested in purchase or trade. Did you miss out on our Rabbits class in April? That’s okay- we’re planning on holding another one in June! Contact Us and let us know what Saturdays you’re available! We’ll schedule the class for the day when the most people are free. Come shop for local, healthy offerings this Saturday! We have amazing pork and rabbit we’ve raised ourselves. Fresh eggs and duck eggs are in stock, too! As always we have a wonderful selection of natural soaps and bath products, candles, teas, and household goods. 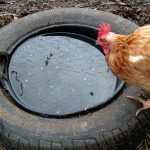 Raising Chickens Class: This Saturday, April 7th 9am! UPDATE: CLASS RESCHEDULED TO SATURDAY 4/28 DUE TO WEATHER. SPOTS STILL AVAILABLE. 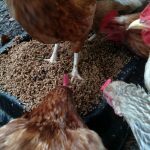 Are you starting a flock of laying hens this spring? Come learn tips and tricks to succeed! We’ll take you through the chicken rearing process, from chicks to adult laying hens. You’ll learn it all, from the basics of feeding and watering to the complexities of keeping them safe from predators. The class will focus on raising chickens, but will apply to ducks and other poultry as well. We have several years of experience taking care of poultry, so come learn from us and save yourself the pain of wasted effort, predator attacks, and other problems! Handouts will detail all the key facts, and include resources for supplies. The class is Saturday, April 7th from 9am-11am. The cost is $20/person or $40/family. Contact us now to reserve your spot in the class. THIS CLASS IS FULL, BUT CONTACT US IF YOU’D LIKE TO BE ON THE WAITING LIST IN CASE OF CANCELLATIONS. The class is Saturday, April 14th, 9am-12pm. The cost is $20/person or $40/family. Contact us now to get on the waiting list for the class. We cover topics such as permaculture, natural pest management, rotational grazing, housing, fencing, and more! In the class we’ll cover health care, feeding, housing, breeding, and have a dispatching and processing session!We also have a special offer for class attendees: 50% off their purchase of rabbit meat in the farm store immediately following the class! The class is Saturday, April 14th, 9am-12pm. The cost is $20/person or $40/family. Contact us now to reserve your spot in the class. UPDATE (3/3/2018): Yes we are still open from 12-4pm despite the wind! This Saturday stock up on products to help your health: 50% off your first week’s order when you sign up for a weekly egg pickup! A weekly egg pickup is where we agree to have eggs available for you every week, and you agree to come get eggs every week. We can setup monthly billing to make this even easier, too! Read more about our delicious eggs below. Our other farm store offerings all support a healthy lifestyle. The soaps and bath products made from organic ingredients and essential oils are a great replacement for conventional products full of synthetic fragrance and other immune system irritants. Be sure to try our healthy meat, eggs, and teat, too! Come pickup a variety of goods this Saturday! One of winter’s challenges is that the short days mean less eggs. Poultry need a certain amount of daylight to prompt them to lay an egg, and so less sun=less eggs. As the days are getting longer, we are collecting more eggs! In addition to increased production from our hens, we are refreshing our flock with an additional forty laying hens that should lay by April. So soon we will be able to meet all of your egg requests, even those of you who contact us about bulk orders! So if we weren’t able to meet your egg needs over the winter, please contact us now as we’d love to help you get delicious, nutritious, farm fresh eggs! This Saturday stock up on products that will make 2018 your greatest year yet! This month’s special is rabbit meat: buy one rabbit, get one at 50% off. Read below about how rabbit meat can help you reach your 2018 goals! Our selection of quality candles, soaps and bath products, meat, eggs, tea and household goods are all sure to improve your quality of life in 2018. Come pickup a variety of goods this Saturday! We’re not saying rabbit meat is miraculous, but it is pretty amazing. No matter what you hope to accomplish in 2018, adding rabbit to your diet can help! Read just a few of its (nearly) miraculous qualities below. Save The Environment: Rabbits grow to harvest size in just 4 months, and have a great feed to meat ratio, meaning they require very little input for the amount of meat. Plus the rabbits are antiobiotic free, so they’re not contributing to the antiobiotic resistant “superbug” problem. Also, since you’re getting them from us, your local farm, the meat doesn’t burn a bunch of fossil fuel being shipped to you. Enjoy Life! : Finally, rabbit meat is delicious and easy to cook. You can make and enjoy a home cooked meal without slaving in the kitchen for hours! Two of our favorite methods for a quick and easy rabbit dinner are to roast it in the oven, or pop it in the slow cooker and make pulled rabbit. Details on both methods are in the article below. Here are our simple and delicious ways to prepare rabbit. 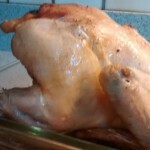 Roast Rabbit: Defrost the rabbit in the fridge over a day or two. Preheat the oven to 350. Remove rabbit from the package, and place in a glass roasting pan. In a bowl, mix olive oil with salt, pepper, and whatever seasonings you’d like (we often use garlic and rosemary). Spoon half of the oil and seasoning mixture over the rabbit. Turn it over, and spoon the remainder of the mixture on the other side. Put the rabbit in the oven, turning it over in about half an hour. Cook until a meat thermometer registers 165, roughly 15-20 minutes per pound. Slow Cooker Pulled Rabbit: Prepare the rabbit as detailed above, but in your slow cooker instead of a glass roasting pan. Cook on low for roughly 6 hours, until the rabbit is falling apart. Remove to a cutting board, and use a fork to “pull” the meat from the bones. Use the meat in any number of ways; some of our favorites are on top of a salad, in chili, with BBQ sauce, and in tacos. The farm store will be open this Saturday 12/16 from 3-5pm for holiday shopping! Need more for the friends and family on your list? Stop by and get thoughtful gifts here! 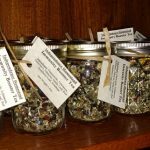 We have a wide assortment of products perfect for giving: organic soaps and bath products, scented candles, beeswax candles, herbal tea, housewares, and more! Address and directions to the farm are here. We hope to see you tomorrow! This Saturday come say hello and do some holiday shopping! This month’s special is 10% off all candles! We offer a wide selection of candles to bring a warm glow to these dark winter days. They also make great gifts! In the farm store we’ll be fully stocked with all of our local offerings: soaps and bath products, pork, rabbit meat, chicken and duck eggs, candles, handmade magnets, coasters, and more! Candles offer a bright light for these dark evenings when the sun sets so early. We have beeswax unscented candles and essential oil scented candles available; both are amazing in their own ways! If you’ve never burned a beeswax candle before, you’re in for quite a treat! The candles have a distinctive, natural fragrance obtained from the storage of pollen and honey in the honeycomb from which the wax was made. The slow release of the natural pollen has been known to help with allergies as well! We just restocked with new candles for the holiday season! Two of our scented candles are just perfect for winter: Fresh Forest scented with juniper, spruce, & basil, and Peace Pearl scented with orange, clove, & cinnamon. We have been burning them non-stop in our home lately and it has been wonderful! The essential oil candles are made of a beeswax and soy wax blend, and scented with only essential oils, no artificial fragrance. The candles have a 50 hour burn and come beautifully packaged to make thoughtful gifts (or enjoy for yourself!). To maximize the burning time of your candle, straighten and trim the wick to 3/8″ before each lighting. Burn pillars for at least 1.5 hours at a time. That will prevent tunneling and burn most of the wax over the life of the pillar. After extinguishing the candle and allowing it to cool a bit, mold the edges inward. As 2017 comes to a close, we would like to thank all of you who supported us this year. It’s been a joy to work with you. We are honored to provide you high quality food, livestock, and other delights. This Saturday come say hello and do some shopping! This month’s special is 20% off egg purchases of 5dz or more! Read all about our delicious, healthy eggs below. In the farm store we’ll be fully stocked with all of our amazing offerings: soaps and bath products, pork, rabbit meat, chicken and duck eggs, candles, handmade magnets, coasters, and more! Farm Fresh Eggs On Sale! The chickens are happy and healthy and laying like crazy right now! With the crazy heat of summer behind us, the ladies are contentedly pumping out eggs. We are enjoying a variety of egg dishes, such as quiche, hard boiled eggs, and breakfast burritos. Eggs are versatile and can be used for breakfast, lunch, and dinner! Not only are our eggs delicious, you’re getting all kinds of nutrients that store bought, factory farmed eggs are missing. According to Mother Earth News, this includes greater amounts of omega-3 fatty acids, and vitamins A, D, and E.
Visit the farm store this Saturday to take advantage of our October special: 20% off purchases of 5 dozen or more eggs! We had a very special birth this past week, we welcomed a baby boy to the family! Garrison Thomas Green was born 9/26/2017. He weighed 8lb 14oz. and was 20.5″ long. God’s perfect plan for the birth including the baby arriving before the midwife, so Harley had the blessing of delivering the baby! We are so thankful for all of His servants who made this wonderful experience possible, and our amazing network of family and friends who support us as parents. His big sister, Rebecca Mae, is very excited about having a little brother and has been giving him non-stop hugs and kisses! We have enjoyed resting and recovering at home as a family this last week, and all of us are doing very well! We will not have open farm store hours the first Saturday in November. We will be open by appointment only that month. Please contact us to coordinate a time to visit the farm store. Farm Store Open Saturday: Buy 10+lbs of Meat, Enjoy 20% Off! This Saturday come say hello and do some shopping! This month’s special is 20% off meat purchases of 10lbs or more! Mix and match any meat from the farm store freezer, and enjoy 20% off your purchase of 10lbs or more. We have rabbit meat and a variety of pork cuts available. Address and directions are on our website here. We are open the first Saturday of every month. We look forward to seeing you soon! We have been carrying Aroma Naturals candles and soap for a month, and we are in love with these products! We have 5 varieties of candle scents for various needs/moods: Fresh Forest (juniper, spruce, & basil), Ambiance (orange & lemongrass), Peace Pearl (orange, clove, & cinnamon), Tranquility (lavender), and Vitality (peppermint & eucalyptus). All are scented with only essential oils. The candles have a 50 hour burn time, and are $12 each. 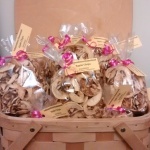 They come beautifully packaged and are great both for personal use and as thoughtful gifts. The new soap offering is a 4-in-1 castile organic soap that is perfect for the shower as it works as a body wash, shampoo, and shaving cream. It is scented with tea tree and eucalyptus essential oils, which refreshes and cleanses. This 34oz bottle with a pump top is so easy to use, and it will last you a long time! At $20, this bottle is a great deal. Visit the farm store this Saturday to try these amazing products! We have several recently weaned litters of heritage Silver Fox rabbits for sale. We have a wide selection of colors and genetics available! To learn more about Silver Fox rabbits as breeders or pets, read our webpages here: breeding stock, pet rabbits. Contact us via those pages to reserve rabbits now! We have a few pigs for sale. 2 piglets born in April, barrows, would be great to either harvest now as roasting pigs, or raise through next summer to process for pork. The piglets are 30-40lbs now. They cost $70/each or $100 for both. We also have 2 breeding sows for sale. They are both expected to farrow in September, having last farrowed in April. Sows are $200 each, or $350 for both. Read more about American Guinea Hogs on our website here. Contact us to buy any of these pigs. 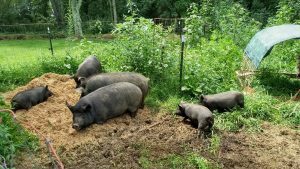 This past weekend we rotated our guinea hogs to a new portion of our orchard. The move here necessitated letting the pigs loose from their last pen, and enticing them to walk about 20 feet over to this new pen. Of course they always wander a bit during the move, but a bucket of grain usually motivates a few into the new pen, and the rest quickly follow. We had a big pile of brewing grain in the new pen so the pigs could eat up! We seeded cover crops in this area after the pigs were last in here, and over the past few months the cover crops grew to make quite the jungle! The pigs will make quick work of it, though. They’ll eat all that forage down, and keep more weeds from growing in the orchard. We have a total of 3 orchard spaces we use to rotate the pigs. While guinea hogs aren’t nearly as destructive to the soil as other pig breeds are, they still make their pens a muddy, stinky mess. Rotating them helps alleviate erosion and smell, plus it’s healthier for the animals. 8/10 Update: hog shares no longer available. Pigs: 2 feeder pigs born in April are still available. $70/each or $100 for both. Reserve Your Hog Share Now & Eat Well All Fall! More details are on our hog share page, included an updated table that shows the expected cost (and savings!) 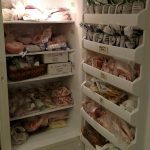 of the half and whole shares, depending on your meat processing selections. To reserve your share, fill out the reservation form on the hog share page. Raise Your Own Pork! Pigs Available Now. -4 Feeder Pigs, all ready to be harvested immediately. Expected hanging weight 170lbs/each. $700 for all. Contact us to learn more or buy a pig! 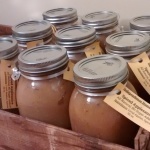 Farm Store Open This Saturday- Sale on NEW Candles and Soap! This Saturday come say hello and do some shopping! This month’s special is 10% off our NEW Aroma Naturals candles and body wash! Details about the Aroma Naturals line and what we carry are in the article below. We are excited to share our latest farm store offering: Aroma Naturals candles and soap! Aroma Naturals is a small business that works 100% in the USA, from the corporate office to the production facility. Plus, the company is devoted to natural, organic products and methods! We have 5 varieties of candle scents for various needs/moods: Fresh Forest (juniper, spruce, & basil), Ambiance (orange & lemongrass), Peace Pearl (orange, clove, & cinnamon), Tranquility (lavender), and Vitality (peppermint & eucalyptus). All are scented with only essential oils, and there are votives of each available for you to smell, too! The candles have a 50 hour burn time, and are $12 each. They come beautifully packaged and are great both for personal use and as thoughtful gifts. The new soap offering is a 4-in-1 castile organic soap that is perfect for your shower as it works as a body wash, shampoo, and shaving cream. It is available scented with tea tree and eucalyptus essential oils, which refreshes and cleanses. This 34oz bottle with a pump top is so easy to use, and it will last you a long time! At $20, this bottle is a great deal. For the month of August we’re offering 10% off all Aroma Naturals products! Come by this Saturday to shop.